Your spine supports your body and enables you to walk upright. It is made up of small bones called vertebrae and a normal spine appears straight when viewed from the back. The vertebrae in your back absorb stress and shock from normal activity. They also allow you to move freely and be limber. The natural curves of your spine can be seen from the side, and your spine appears straight when viewed from the back. A person which has an unnatural curve to their spine has one or more curves which can be seen when their spine is viewed from the back. In orthopedic medicine curvature of the spine is classified from mild to severe. Curvature of the spine is more common in girls than in boys. It can occur at any age, but generally manifests by age 10. There are three main types of curvature of the spine. Lordosis is also known as swayback. This condition causes the spine to curve inward at the lower portion of the back and can be significant. Lordosis can cause significant pain in the lower back and interfere with normal activities. Kyphosis occurs when the upper back becomes curved at more than a 50 degree angle from normal. You have probably seen older women with this type of curvature. Their upper back may be hunched over giving them a stooped appearance. Scoliosis is the most common type of curvature problem and creates a C or S curve in the spine. If left untreated scoliosis can cause serious complications such as a person’s ribs rubbing together and even cardiopulmonary complications. Many times the cause of this condition is not known (idiopathic). Curvature of the spine may be present in very young children and infants, or it may not develop until later in childhood. Some of the causes of curvature of the spine may include degenerative bone disease, obesity, inflammation of the disks of the back, Spondylolisthesis a condition in which the vertebrae slips forward (usually in the lower back), and Achondroplasia in which the body’s bones do not grow properly. Arthritis, tumors, poor posture, andScheuermann’s disease which causes the vertebrae to be misshapen can also cause the spine to develop an unnatural curve. Many times curvature of the spine develops slowly and is not noticed until it causes pain or visible signs. The condition may be caught in routine physicals or school exams. Parents may notice a child’s head is tilted to one side, one shoulder is held higher than the other, or one of their child’s hips is higher than the other. These are all common symptoms of scoliosis. Lordosis and kyphosis may cause pain and obvious curvature which is noticeable as it progresses. In severe cases it may be difficult to breathe and you experience chest pains. The first step in diagnosis is an exam by your doctor. He or she will ask you about your family history, any weakness or numbness you may be experiencing, and ask you to remove your shirt and bend over to try and touch your toes. This helps your doctor see any curves in your back. Your doctor will also observe the symmetry of your body, how your shoulders and hips line up, and if you tend to hold your head to one side. They may also check your range of motion, reflexes, and muscle strength. If the patient is a child the doctor will measure their height and weight for future reference since curvature of the spine will worsen if not treated as the child grows. If your doctor suspects you or your child has curvature of the spine they may order more tests such as x-rays of your back. He or she will use these to monitor the progress of the curve and to assess the severity of your condition. You doctor may also refer you to a doctor specializing in orthopedics if your condition is severe or progressing quickly. Your treatment will depend mostly on how fast the curvature is progressing, or how quickly your doctor feels your condition will worsen. Treatment normally falls into three categories: observation, bracing, and surgery. If the curvature stays below 25 degrees observation is used to monitor the condition’s progress. Between 25 and 40 degrees bracing may be used to slow the progress, but after the curvature reaches 40 degrees surgery is generally recommended. Mild curvature may not require any treatment. Your doctor may prescribe exercises to strengthen your back muscles and help with your flexibility. Yoga and stretching exercises will not cure the curvature of your spine, but may offer some relief from pain and stiffness. Your doctor will monitor the progression of the curvature and you may need to visit an orthopedic doctor every six months. Bracing is a good option for cases in which the curvature of the spine is progressing slowly. Braces may be worn during the day or only at night. The success of using bracing depends upon your ability to follow your doctor’s instructions and wear the brace correctly and for the correct amount of time each day. For some people the curve of their spine does not go beyond 40 degrees after they have reached adulthood. If this is the case then surgery is usually not needed. However if the curvature is progressing after adulthood surgery by a doctor specializing in orthopedics may be the only option to stop the progression of the disease and provide relief. Fusion surgery is used to fuse the vertebrae of the spine using rods, pins, and screws. Your doctor may insert a metal rod into your spine and secure it with pins and screws to straighten your spine and give it support. The rod, pins, and screws are not removed and stay in your back. Recovery time varies with patients, and your orthopedic surgeon will usually want you up and walking as soon as the next day after surgery. 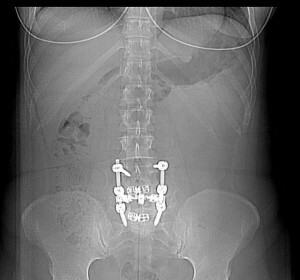 As with all surgeries there are risks, but this is a very effective treatment option for severe curvature of the spine. The treatment of curvature of the spine is based on its severity. Many time symptoms show up early in childhood and continue to progress into adulthood. Contact a doctor that specializes in orthopedics if you suspect you or your child suffers from curvature of the spine.